As I turn a sharp corner from the tasks of Thanksgiving, I’m met head-on by another rapidly growing to-do list. My focus on Christmas cards, gift ideas, decorations, and teacher gifts so easily clouds my intention to focus on Christ this holiday season. 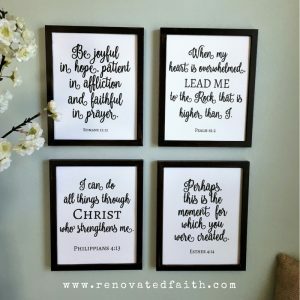 Why do I struggle most with finding time to spend with God during the holidays? How ironic that the word “holiday” actually means “Holy Day” – a time set a side to remember and meditate on the gift of His Love that came in an unlikely manner to an unlovable people. This year, my prayer is to focus on the true meaning of Christmas and to do away with anything that takes the spotlight off of Christ and His birth. Maybe that means not doing Christmas cards this year or that many the people on my gift list get gift cards. Maybe I buy my desserts this year (gasp!). It’s ok to let some things go if it means having time to relish the joy this season brings. What are your biggest distractions? What tasks do you need to distance yourself from this Christmas in order to grow closer to Him? What items on your to-do list are life-draining and which are life-giving? Ask the Holy Spirit to increase your awareness of God’s promised presence this Christmas season. 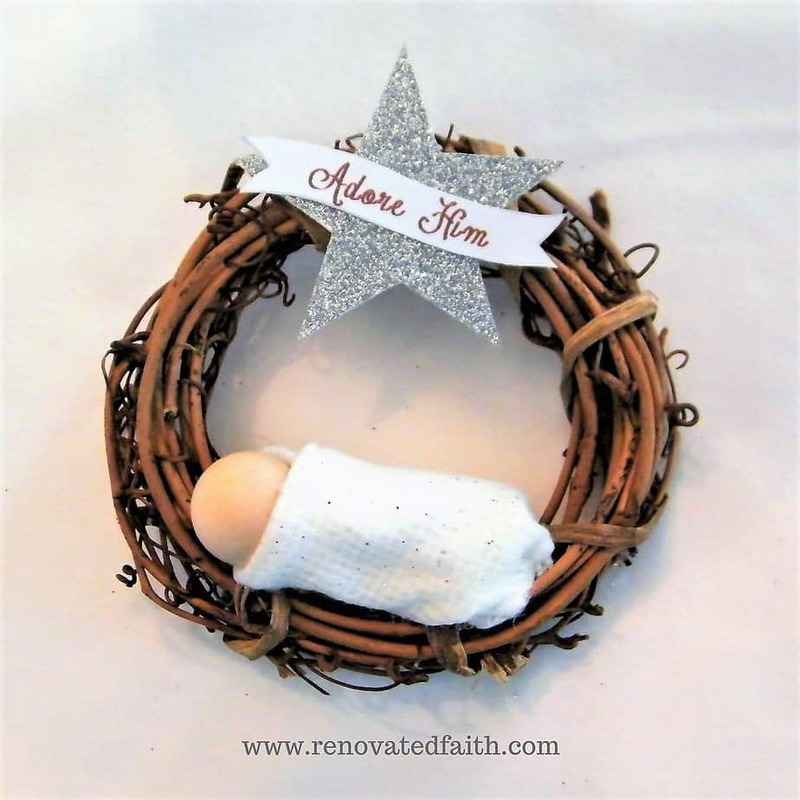 I like to surround myself with decor that reminds me of the true focus of this time of year – that over 2,000 years ago a baby was born to be a messenger of salvation and love to a lost world. One such item is this Nativity Ornament. 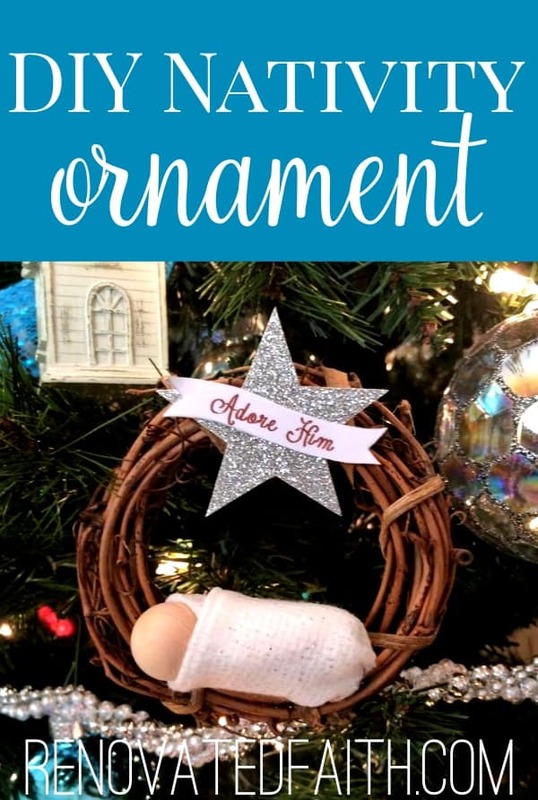 It is such an easy craft to make with your kids but also a classy addition to your tree. Next, use the same file to print the star stencil. 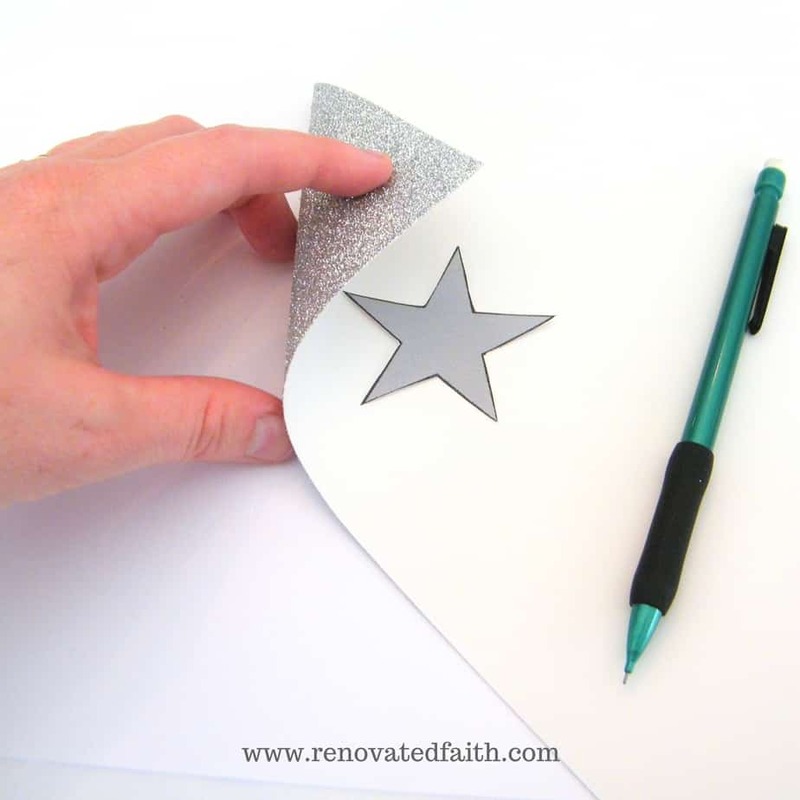 Cut out the star on card stock and use it as a stencil by tracing it on the back of the silver glitter scrapbook paper. Cut out your star. 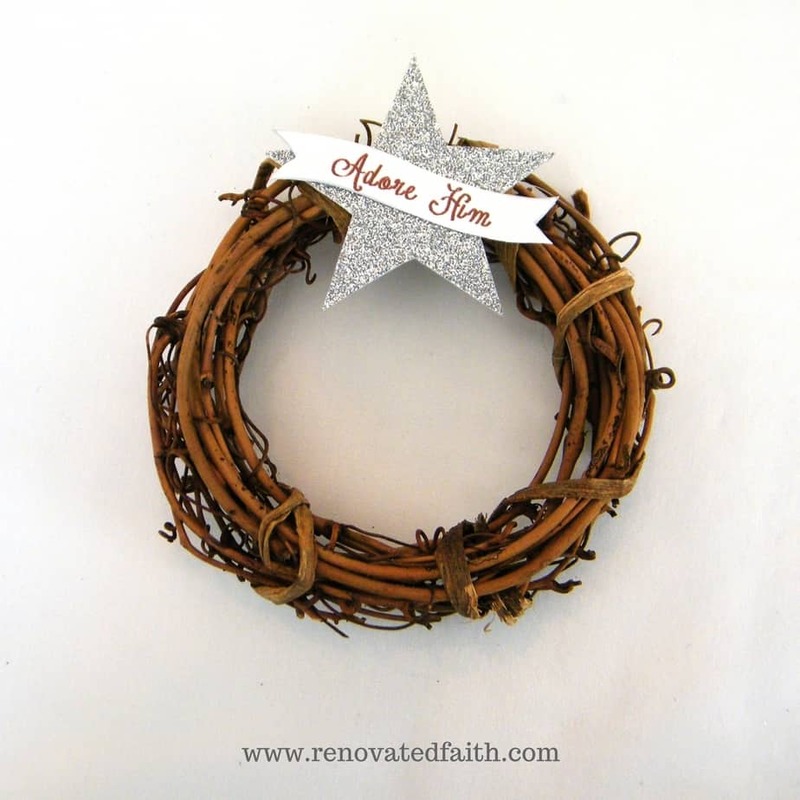 Adhere your star to the top of the wreath with hot glue. Then, add a small amount of hot glue to the back of the banner and attach it to the star. 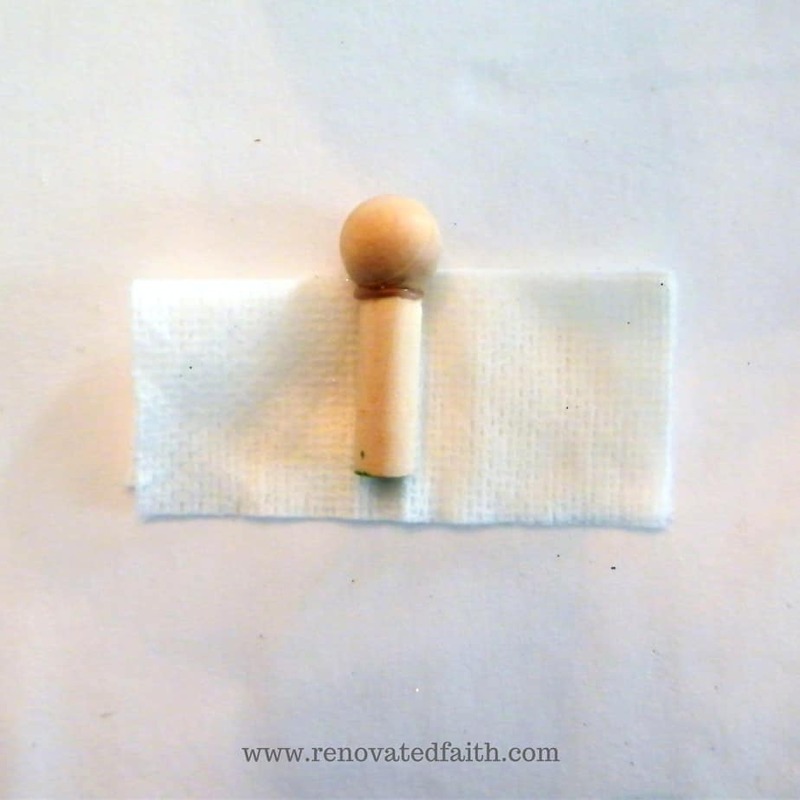 Now, take the round ball and hot glue it to the dowel rod piece like so. (I cut off a small piece of dowel rod with a trim saw.) Use plenty of hot glue and don’t worry if it is visible because we will cover that part with the gauze. Cut two four-inch squares of gauze and fold them over to make a rectangle. Hot glue the baby in the middle, positioned so the gauze just covers the glue on the neck. 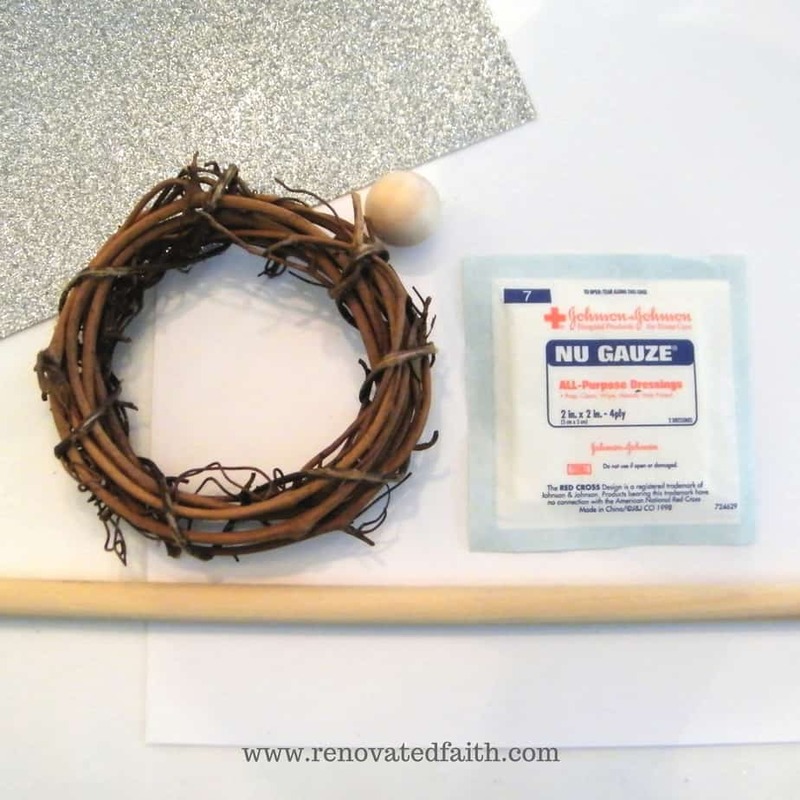 Wrap the gauze around Baby Jesus and secure it with more hot glue. At this point you can sprinkle some glitter over the outside of the swaddle. The glitter will get stuck in the gauze well enough that you don’t need glue. 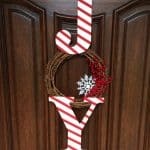 Use a generous amount of hot glue to secure it to the wreath. Finally, add a piece of twine at the top or just a hook and it’s ready for the tree! 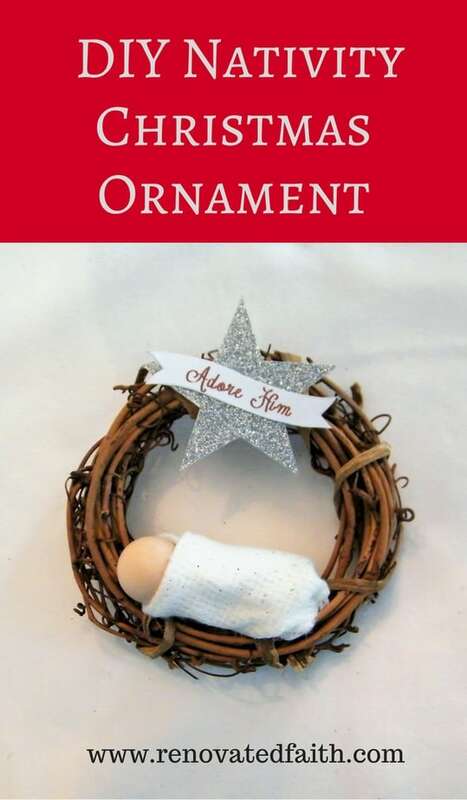 Now, you have a cute nativity ornament to help you to remember the present of His presence this holiday season. 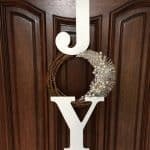 Be sure to subscribe to the blog as next week we will make the JOY wreath below!